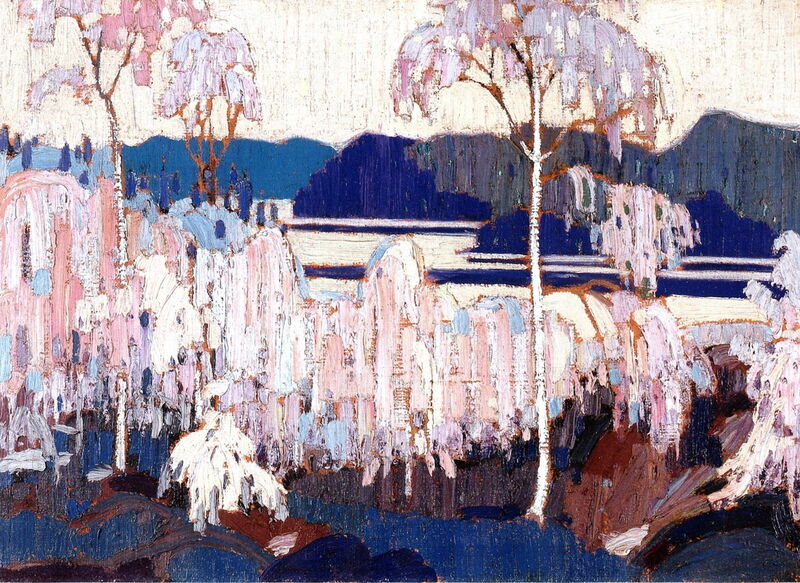 The most important task that Tom Thomson had during the winter of 1915-16 was to paint a set of decorative panels for his patron’s cottage near Georgian Bay, which he had measured up during the previous summer. 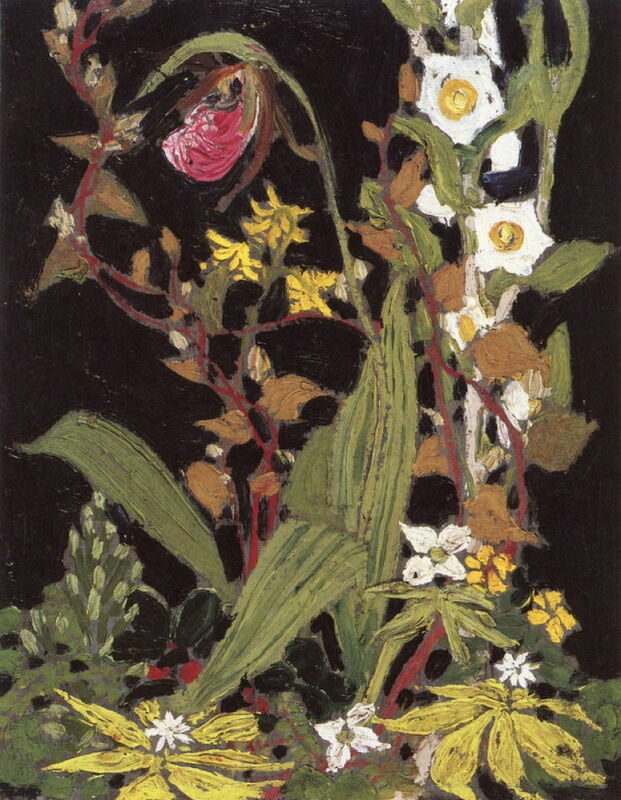 Tom Thomson (1877–1917), Decorative Panel (I) (1915-16), oil on Beaverboard, 120.8 x 96.4 cm, National Gallery of Canada / Musée des beaux-arts du Canada, Ottawa, ON. The Athenaeum. Decorative Panel (I) (1915-16) is one of the resulting panels, painted on Beaverboard, a sheet of compressed wood fibre commonly used in building. These are among his largest works, being just over a square metre in area. His decorative style owes more to his early career in commercial graphics, shows the influence of art nouveau, and contrasts greatly with his later plein air oil sketches. Unfortunately, four of the panels didn’t fit, and had to be taken back to Toronto. Tom Thomson (1877–1917), After the Sleet Storm (1915-16), oil on canvas, 40.9 x 56.2 cm, Art Gallery of Ontario, Toronto, ON. The Athenaeum. Another painting which was the product of his winter studio time is After the Sleet Storm (1915-16), a medium-sized canvas showing the beautiful effects of sleet frozen onto the canopies of birch trees, in the cold half-light of the northern winter. The pale pinks and blues shown on the trees here are reminiscent of spring blossom, a popular theme in the paintings of Vincent van Gogh, with his Japonism(e), although there seems no evidence that Thomson manifested Japonism in any of his other works. Tom Thomson (1877–1917), A Northern Lake (Spring 1916), oil on composite wood-pulp board, 21.6 x 26.7 cm, Art Gallery of Ontario, Toronto, ON. Wikimedia Commons. In the early Spring of 1916, Thomson joined Lawren Harris and Professor MacCallum on a canoe trip in Algonquin Park. 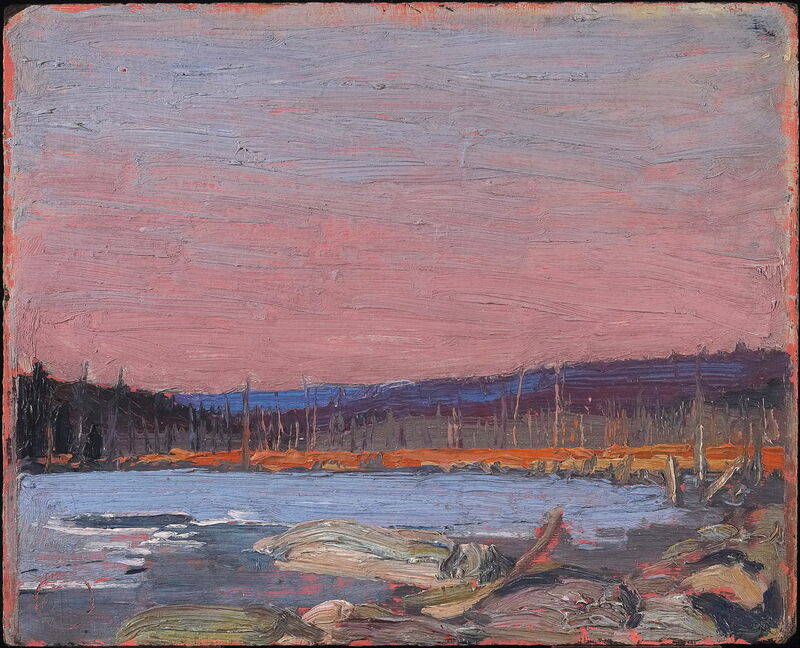 A Northern Lake (Spring 1916) marks his return to plein air oil sketching for the season. After that Spring trip, Thomson worked as a ranger in the park for a month or so to supplement his income. 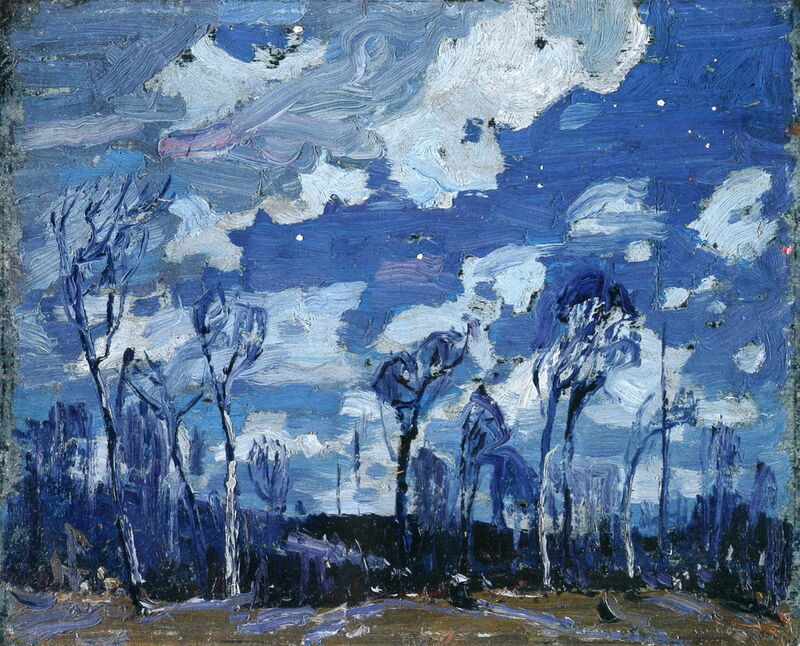 Tom Thomson (1877–1917), Nocturne: The Birches (1916), oil on composite wood-pulp board, 21.6 x 26.8 cm, National Gallery of Canada / Musée des beaux-arts du Canada, Ottawa, ON. The Athenaeum. Nocturne: The Birches (1916) is another of Thomson’s nocturnes, this time with ragged and blotchy clouds above broken woodland. Tom Thomson (1877–1917), Orchids, Algonquin Park (or Lady Slipper) (1916), oil on composite wood-pulp board, 26.8 x 21.7 cm, Art Gallery of Ontario, Toronto, ON. The Athenaeum. Thomson continued to paint occasional floral works. Orchids, Algonquin Park (or Lady Slipper) (1916) shows a group of wild flowers which includes the Pink Lady’s Slipper Orchid, the single pink flower at the upper left. As with his earlier flower paintings, these are set against a black background, but here he appears to have used a darker ground, or possibly omitted the ground altogether. 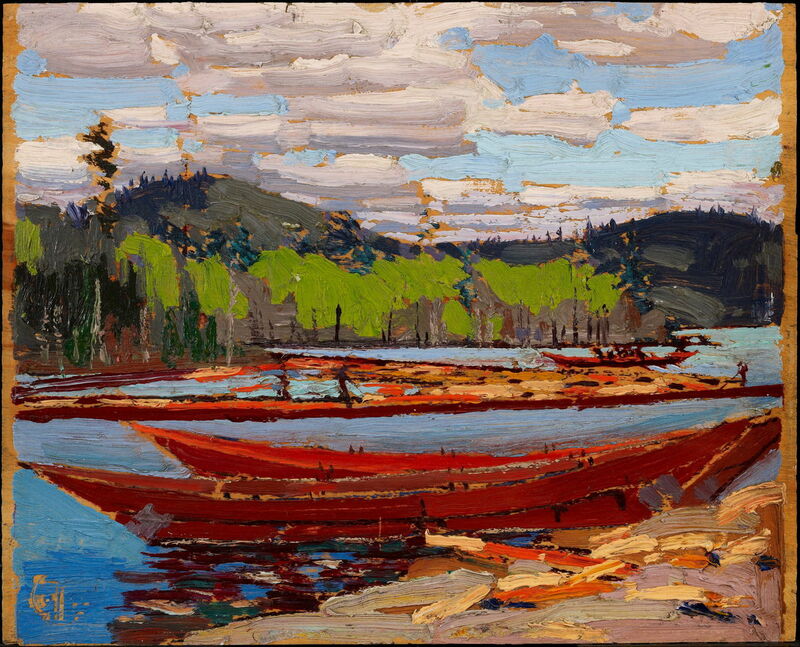 Tom Thomson (1877–1917), Boats (1916), oil on wood, 21.5 x 26.8 cm, Art Gallery of Ontario, Toronto, ON. Wikimedia Commons. 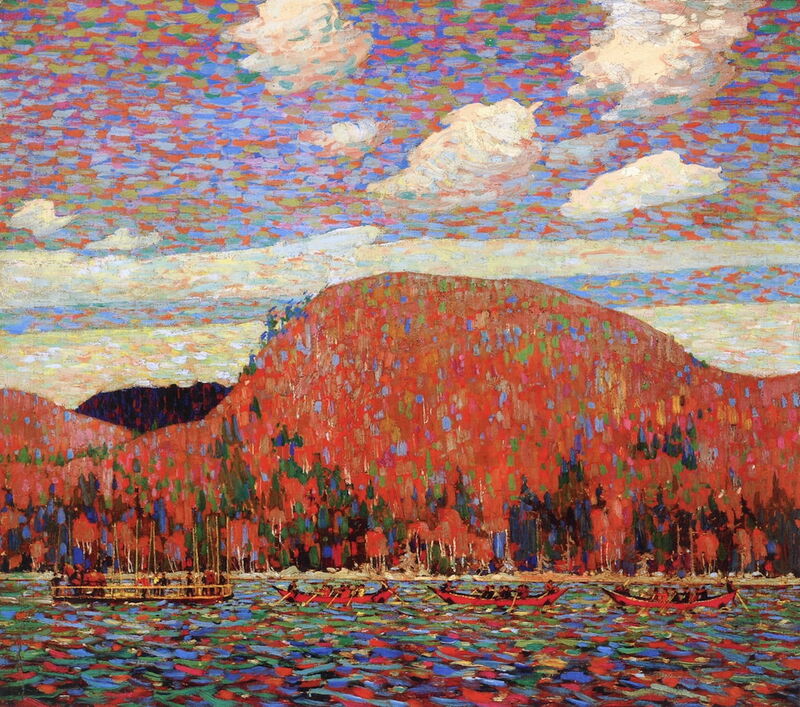 Boats (1916) shows the ‘pointer’ craft used by loggers, which give the lower half of the painting an autumnal fire to contrast with the fresh spring foliage in the band above. The exposed ground at the left and right edges is consistent with this work being painted in a pochade box of the type owned by Thomson at the time. Tom Thomson (1877–1917), Autumn, Algonquin Park (1916), oil on panel, 21.6 x 26.7 cm, Private collection. The Athenaeum. After the previous year’s series of paintings showing intense autumn colours, Thomson’s works from the following year seem more limited and controlled. 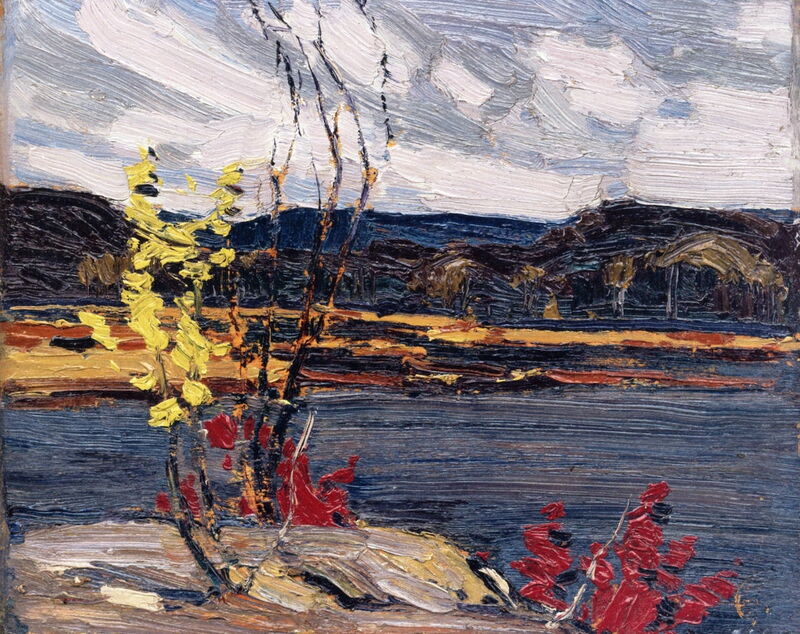 His Autumn, Algonquin Park (1916) constrains the yellows and reds to small areas in the foreground. Tom Thomson (1877–1917), The Dead Pine (1916), oil on panel, 26.7 x 21.4 cm, Private collection. The Athenaeum. 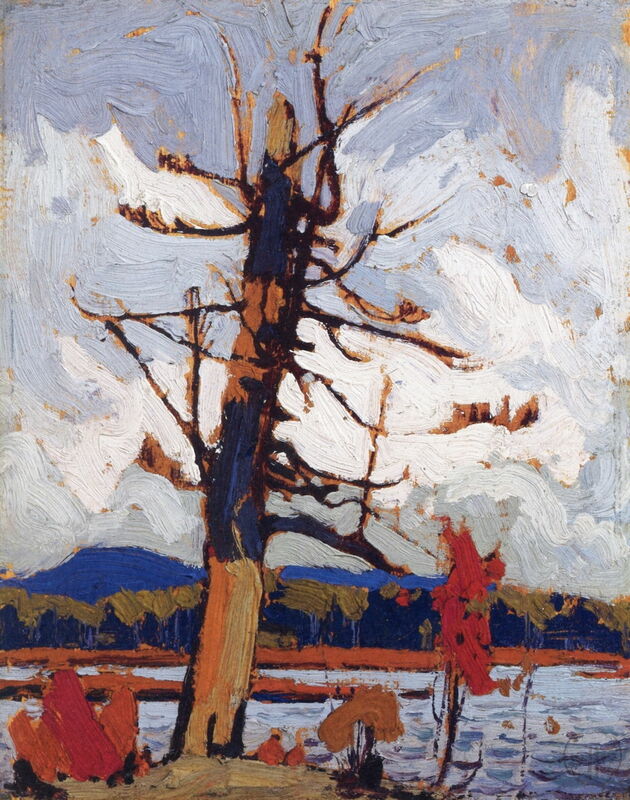 The Dead Pine (1916) is one of a series of sketches which culminated in two of his major studio works of the following winter. This explores a solitary dead tree against a normal daytime sky, with more muted autumnal colours. 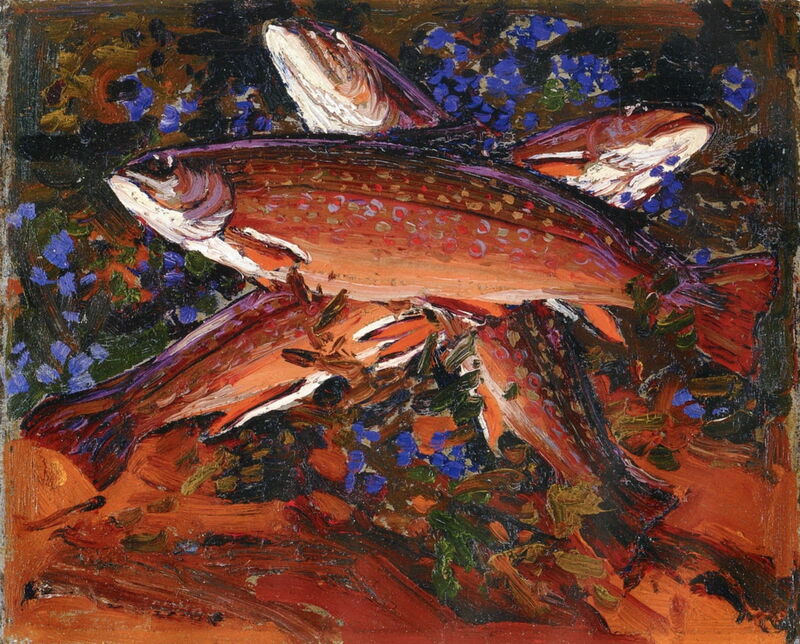 Tom Thomson (1877–1917), Autumn, Three Trout (1916), oil on composite wood-pulp board, 21.6 x 26.7 cm, Art Gallery of Ontario, Toronto, ON. The Athenaeum. When not painting so quickly, Thomson’s oil sketches are still quite finely detailed. Autumn, Three Trout (1916) is an unusual still life over which he was clearly able to take more time. It is often argued that, had Thomson lived and painted longer, he would have painted abstract works. I think that is completely unfounded: all the evidence from his work is that he worked intensely to create paintings which were a faithful depiction of nature at a moment in time. When he was not racing to capture the changing light and conditions, as here, he remained a careful realist. Tom Thomson (1877–1917), The Fisherman (1916-17), oil on canvas, 51.3 x 56.5 cm, Art Gallery of Alberta, Edmonton, AB. The Athenaeum. The winter of 1916-17 was very busy. Others encouraged him to be as productive as possible, and Thomson tackled a series of larger canvases which were based on his sketches from earlier in the year. The Fisherman (1916-17) is a medium-sized canvas which today is rated quite poorly by most critics, which I find surprising. 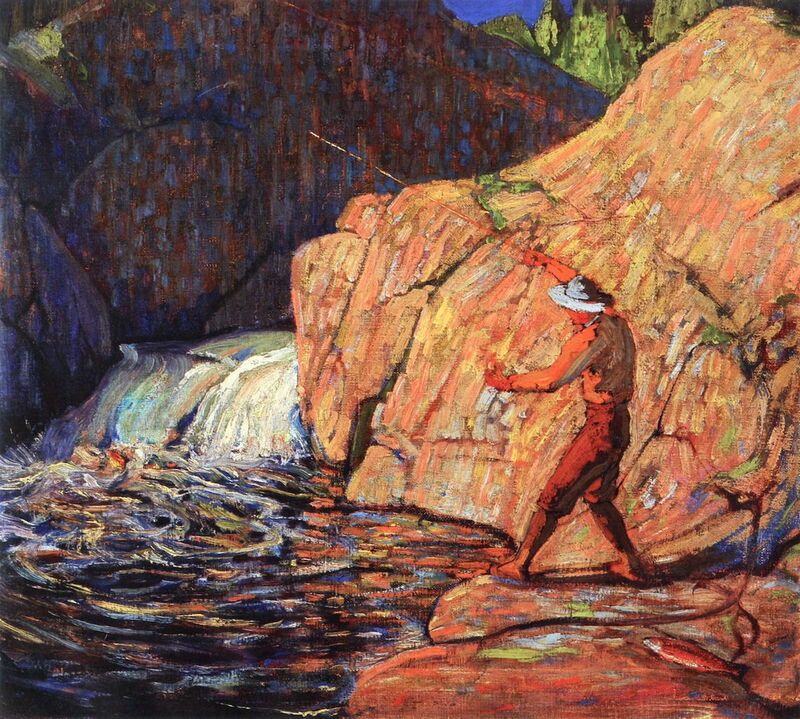 This is probably the closest that Thomson came to figurative painting, and appears to have been carefully composed to bring together the brilliantly-lit fisherman and rocks behind, the shaded rock wall at the back of the river, and the broken water and fractured reflections on its surface. The Pointers (1916-17) is a larger canvas which Thomson painted in his Toronto studio during that winter. Its title refers to the loggers’ pointer boats shown crossing this lake. Unusually this appears not to have been based on an identifiable preparatory sketch. 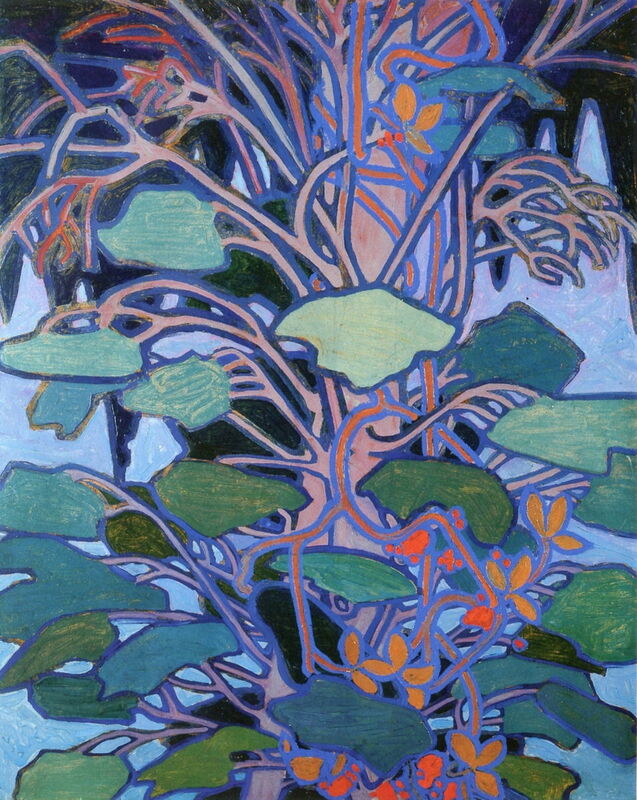 Thomson’s use of small patches of bright and contrasting colours is reminiscent of the Divisionist techniques of Neo-Impressionism. The types of brushstroke, their directions, and colour combinations vary according to the area being painted. For example, the lake uses longer and finer strokes on a black background, which give the impression of low waves reflecting the colours of the hill and sky. Those for the trees are similar to his earlier Autumn Foliage (1915). His other studio paintings from that winter are even more celebrated. Posted in General, Painting and tagged Canada, Divisionism, Group of Seven, Harris, landscape, Neo-Impressionism, painting, Thomson, van Gogh. Bookmark the permalink.